This time of year, it’s hard not to see commercials or read blogs about the all the back-to-school sales at all your favorite stores. If you want to get the most out of your money while getting the kids ready for school ahead of time, why not take advantage of these sales the right way? Save big for the upcoming school year by following these 5 special My Tio Rico tips. Books are the most expensive part of going to school. It’s outrageous how pricey they can be! Save money by asking friends or older students if they have extra copies to borrow or check out used books stores and Amazon.com. Be sure to compare prices in a few different places before actually purchasing. What you end up with might be a little beat up, but that’s not what matters in the long run! Sometimes all those supplies that add up are scattered around your home in places you don’t even realize! You more likely than not will be able to reuse supplies from previous years, though they may be slightly worn down. Be sure to do a thorough check through your closets or desks before heading to the store to purchase new items. Save time by shopping for all school items at one store. Driving around to several different places to get the best deals on single items won’t really save you as much when you factor in your time spent (and gas spent) when shopping. Being efficient when you shop will contribute to your savings. Sometimes the sales before school starts are more expensive than the sales after school starts. How sneaky? Try holding back on those items you know you can get away without for the first couple weeks of school before buying them for even cheaper a few weeks later! Pack your lunches with reusable materials. Zip-lock bags and plastic sporks are wasteful environmentally and financially. Use tupperware and other reusable supplies that can be purchased cheap. You can even get materials with your favorite colors and designs! 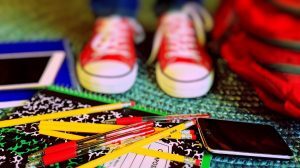 Though these tips may help some with their back to school savings, if you find yourself low on money this season try looking into our Personal Loans in Arizona program. It’s a great way to quickly and easily get cash in your pocket so you’re not stuck missing out on all the sales waiting for your next paycheck. To learn more about the loans My Tio Rico has to offer, call one of our Personal Loans in Arizona experts today or fill out the quick application form to the right. !